Those essays were quickly picked up by other printers, first in Philadelphia and then in other American ports. In 1768 they were collected under the title Letters from a Farmer in Pennsylvania to the Inhabitants of the British Colonies. They became the most influential political writing to appear in America until the Revolutionary War. 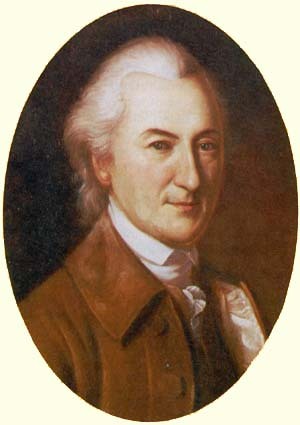 The “Farmer” was John Dickinson (1732-1808, shown here), already a prominent lawyer, politician, and estate owner in Delaware and Pennsylvania (which were then administratively linked). He had served as a delegate to the Stamp Act Congress, but the Letters made him a leading American Whig. Dickinson’s first letter was dated 5 November. Three weeks was an unusually long gap between the composition of an eighteenth-century newspaper essay and its publication, and it’s conceivable that Dickinson took that time to write further. More likely, however, he carefully chose the date of 5 November because it was auspicious in British history. That was the anniversary of the foiling of Guy Fawkes’s attack on Parliament in 1605 and also the anniversary of William III’s landing in England to depose James II in 1688. By focusing on that issue first, Dickinson told his readers that there was more at stake than “external taxes” on imports from Britain. Colonists couldn’t assume the London government would stop with tariffs. And by taking up New York’s grievance, he signaled that no colony should have to resist alone; that first essay closed by chiding the Pennsylvania legislature for not protesting on New York’s behalf. In Massachusetts, Edes and Gill’s Boston Gazette started reprinting the “Farmer’s Letters” on 14 December. Ironically, the only other local newspaper that published all of them was John Mein’s Boston Chronicle, which would soon become the voice of the royal government. But by spring 1768 all of Boston’s newspapers—even Richard Draper’s Boston News-Letter—were filled with praise for Dickinson’s essays.